Our organic wildcrafted & blue agave syrups are delicious, low glycemic index (GI) sweeteners that taste somewhere in between honey and maple syrup. The wild agave is harvested by an organic indigenous grower association, consisting of descendants of the Aztecs in the region of Ixmiquilpan in Mexico. The wild agave plant is central to their culture and they have harvested it for thousands of years. 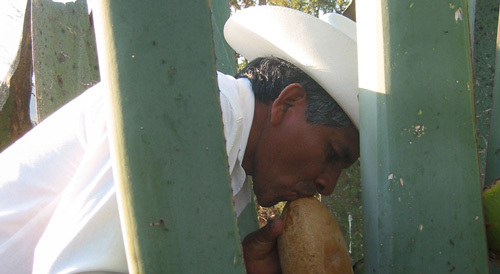 By buying our wild agave syrup you are providing a sustainable source of income to these indigenous farmers helping them to stay on their land - many indigenous Mexican farmers are not able to survive on their native land and are forced to immigrate to the U.S.A. and look for work. Our farmers in Mexico use HPLC to make chromatographic studies on sugars, monitoring closely the mineral and sugar concentrations of our agave syrups – the best available in the market. Whereas our blue agave nectar is produced from only the Weber Azul or Blue Agave plant (Agave tequilana), which is also used to make tequila, wild agave nectars are made from up to 6 different agave species, but primarily from Agave salmiana. 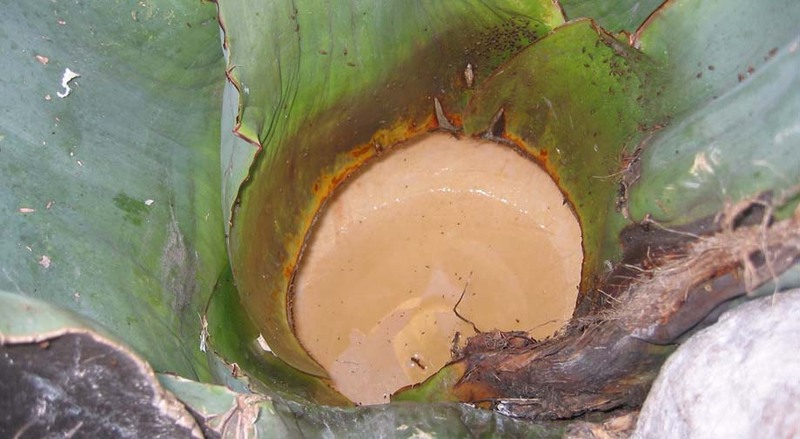 To produce wild agave syrup, juice is extracted naturally by the harvester sucking the liquid from the core of living agave cactus plants. Similar to how a bee creates honey, it is through enzymatic action that the complex sugars in fresh agave juice are converted into simple sugars, producing agave nectar. The temperature in the entire process never exceeds 45 degrees Celsius. This minimal processing and minimal heat provides vitamins, minerals and enzymes in agave nectar that are not found in other processed sweeteners. 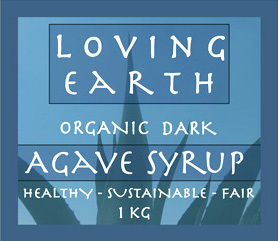 The dark agave syrup is not filtered and has the maximum amount of minerals and other phytonutrients. It has a rich vanilla-like aroma with a deep wild flavour. The light agave syrup is filtered and has a more neutral sweet flavour making it the perfect replacement for sugar in any recipe. The main form of carbohydrate in agave syrup is a complex form of fructose called inulin or fructosan. This is absorbed slowly into the bloodstream giving it a low glycemic index and is therefore diabetic friendly. It is also the perfect sweetener for children as it does not significantly raise blood sugar levels, preventing the highs and lows associated with sugar intake and instead provides a sustained, steady source of energy. There has been controversy regarding the use and promotion of Agave Syrup as a health food. 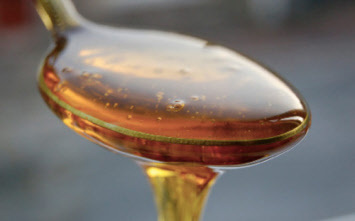 Agave Nectar - The high fructose health fraud, an article written by Rami Nagel and Beware of the Agave Nectar Health Food Hype by Dr Mercola are the sources of the confusion. Both Authors have presented some valid information regarding conventionally grown and processed Blue Webber Agave. However, the information presented is not an accurate representation of Loving Earth's Agave products. Our wild agave is a Wild Maguey (Salmiana Variety). It is wild crafted, certified organic and organically processed at low temperature. We source it from it from Loving Earth who work closely with the Indigenous association of Ixmiquilpan. They have met the growers in person and seen their operation. 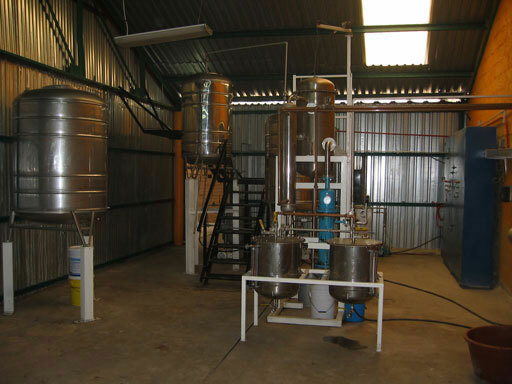 These growers do not produce tequila they run a small-scale operation producing only Agave Syrup. Our agave is raw - it is vacuum evaporated at 45 degrees and a certified organic, vegan enzyme is used to break down the sugars. It contains 70-75% fructose unlike the Blue Webber variety, which can have fructose levels as high as 90%. The vacuum evaporator is shown in the photo alongside. Minimally processed agave provides vitamins, minerals and enzymes that are not found in other processed sweeteners. Our unfiltered Dark Agave syrup has a wide spectrum of minerals and phytonutrients. Dr Mercola is erroneous when he states that dark agave is burnt. The light and clear varieties of Agave have undergone filtration, which is why they are lighter in colour. The Dark agave is unfiltered and richer in minerals, this results in its darker colour.Unlike high fructose corn syrup that stores its energy as starch, Agave Syrup stores its energy as Inulin, also known as Fructans or Levulose. Inulin is typically found in roots or rhizomes. There is no starch in Agave Syrup. Inulin bypasses digestion in the stomach and small intestine and is actually digested in the large intestine. Inulin actually feeds the probiotic bacteria in our digestive system. This is absorbed slowly into the bloodstream giving it a low glycemic index and is therefore diabetic friendly. It is also the perfect sweetener for children as it does not significantly raise blood sugar levels, preventing the highs and lows associated with sugar intake and instead provides a sustained, steady source of energy. Agave syrup is a concentrated fruit Juice. Like all sweeteners Loving Earth believes that agave should be consumed in moderation. We believe that Agave Syrup is a healthier sweetener alternative compared to cane sugar. When used respectfully Agave syrup does have health promoting properties. Overconsumption and inappropriately using Agave is what leads to health issues and puts our bodies out of balance. Agave should be used as part of a balanced diet. 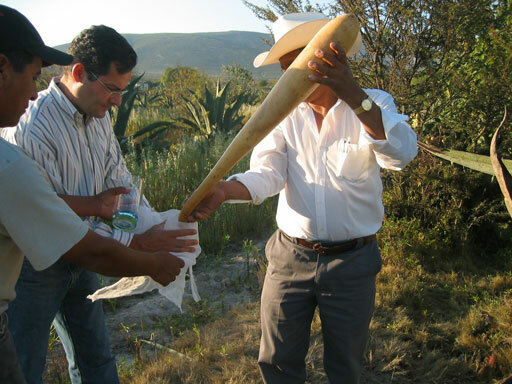 In the region of Ixmiquilpan of central Mexico an indigenous group called the Hnahnu have been able to successfully commercialise agave syrup. 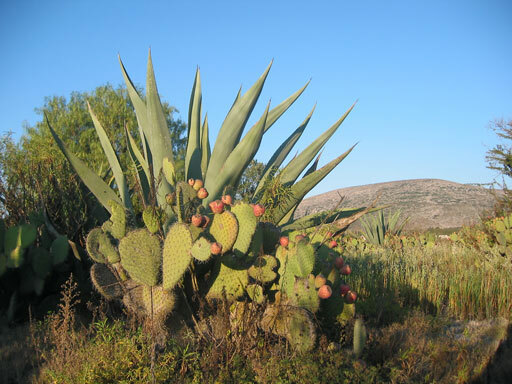 This is a semi arid region and the main species of plant is the wild maguey (Agave salminae). In this area like many of the poorer areas of Mexico a lot of the men had gone to the US to work and there were whole villages without any men. However now that the new industry of harvesting the nectar of the wild maguey and processing it into agave syrup has been established this has created sustainable income opportunities for the local men and women. Natural agave has been harvested traditionally in Mexico for hundreds of years. Ranking fairly low on the glycemic load scale, a small amount of the nectar provides a larger amount of sweetness than common sugar, and thus, a little goes a long way. The agave plant also contains saponins and fructans, phytochemicals associated with antimicrobial, anti-inflammatory and immune-boosting capabilities. (Journal of Ethnopharmacology, 1996; 52:175-7). One of these fructans is known as inulin, a natural plant sweetener with an extremely low impact on blood sugar and cholesterol levels. The ancient Aztecs even used the nectar as a healing salve for wounds. What is more, compounds derived from blue agave have been studied for their potential utility for treating colon diseases like ulcerative colitis, irritable bowel syndrome and Crohn’s disease. Agave also holds high amounts of protein-building amino acids and alkaloids (Plant Foods Hum Nutr 2007; 62:133-8). Research indicates that minimally-processed agave does provide nutrients to the human body, and may even prevent chronic disease (Nutr Rev 2004; 62: 439-42). Dr. Mercola is mistaken as regards agave nectar. Agave’s rise in popularity is due to its quality and appeal which have led to widespread demand for it by consumers worldwide. Dr. Mercola though insinuates that agave’s success is simply the result of clever marketing, and this is far from the truth. His presentation of this article and unsubstantiated opinions is to us a real example of negative marketing as he clearly uses fear in lieu of fact to promote his agenda. Dr. Mercola appears to be leading the reader down a biased path to a negative conclusion. He has used fear tactics to propagandize against agave nectar and Madhava feels that this is outrageous and must be answered. The following article released just last week, based on scientific research, and right in Mercola’s field as an osteopathic physician, is an example of actual research he chooses not to reveal to his readers in his attempt to bias them. He has been selective in the information he disseminates and this severely limits his credibility on the subject of agave. An ingredient in agave - the plant used to make tequila - may help fight bone-weakening osteoporosis and other diseases, Mexican researchers say. Dr Mercola’s article is disheartening, because so many people rely upon Dr. Mercola for their alternative health information. People are being led to believe that use of agave to sweeten is somehow harmful and this is not the case. There is hard evidence to the contrary, and only negative associations and suppositions to form the attack. 1. Poor Quality Control. There are very few quality controls in place to monitor the production of agave syrup. Nearly all agave sold in the U.S. comes from Mexico. Industry insiders are concerned that agave producers are using lesser, even toxic, agave plants due to a shortage of blue agave. This is an outright fabrication. Loving Earth routinely visit and inspect all our suppliers’ facilities in Mexico. The suppliers are Organically Certified and 3rd party audited or in the process of being so. Each has an in house laboratory for analysis and quality control. In addition our facility in Melbourne is both USDA Organic Certified & Australian Certified Organic and we are routinely inspected as well. Mercola makes it sound like these are poorly run, low budget operations in Mexico, and this could not be further from the truth. These are immaculate facilities that are conducted extremely professionally, run by highly intelligent individuals with high standards that easily meet international levels. Loving Earth and Madhava is quite fortunate to be working with such reputable companies. And, it has been well documented in newspapers both in Mexico and the US that there has been an overabundance of supply of agave plants, not a shortage in any way. Madhava staff have personally witnessed fields left to go to seed after eight years invested due to the current surplus. Dr. Mercola fabricated his statement to shamefully suggest “toxic” plants could be used and create more unwarranted doubt. If he had facts he would not need to resort to fear. 2. Pesticides. There are also concerns that some distributors are cutting agave syrup with corn syrup - how often and to what extent is anyone’s guess. In addition, the FDA has refused shipments of agave syrup due to excessive pesticide residues. Any concerns are due only to rumours such as this. Both our wild & our blue agave syrup is 100% pure from the agave plant with no additives whatsoever. We would be very interested in his source of information about the FDA refusing shipments. We know without a doubt that none of our shipments have ever been refused and turned back, and know of no others that have been either. We believe Dr Mercola would post a fact or cite an example if he had one. 3. Saponins. Agave is known to contain large amounts of saponins. Saponins are toxic steroid derivatives, capable of disrupting red blood cells and producing diarrhea and vomiting. There is also a possible link between saponins and miscarriage by stimulating blood flow to the uterus, so if you’re pregnant, you should definitely avoid agave products. This is clearly a cruel scare tactic. The fact is that saponins are in a lot of foods we eat. There are many varieties just as there are over 200 varieties of the agave plant. Most beans and legumes, soya beans, onions, paprika, alfalfa - these all contain saponins. Saponins are phytosterol compounds that occur naturally in some plants. Saponins have antimicrobial and antifungal properties, along with anti-inflammatory and immune-stimulating properties. As for agave syrup, there is no evidence to cause concern, there has never been a report of agave nectar linked to a miscarriage, and there is a long history of use. From the prehispanic times, the only sweet treat available to Indians in Mexico was the cooked leaves of the agave plant. They are still in markets all over Mexico. If there would be any kind of dangerous substance, this would be the absolute extreme case of exposure to it; not a single case of any problem has ever been documented, this goes back over seven centuries. While “some species” of the 200 identified agave species contain the toxic saponins anordin and dinordin, no research has been presented identifying these substances in the two species used for agave syrup. Nor have they been identified in agave nectar itself. Agave Syrup in its present form has been sold for over 12 years all over the world, including western Europe, Japan and the U.S.. The product has a proven record of safety and is deemed safe by the FDA and all regulatory bodies all over the world. 4. Hydroxymethylfurfural (HMF). Some agave syrups contain a contaminant called hydroxymethylfurfural (HMF, also called 5-hydroxymethyl furfural), an organic heat-formed compound that arises in the processing of fructose - in both agave syrup and HFCS. HMF has potential toxic, mutagenic and carcinogenic effects[iv]. HMF is EXTREMELY toxic to honey bees, which is a problem since commercial beekeepers feed HFCS to the bees to stimulate honey production when field-gathered nectar sources are scarce[v]. Some agave is thermally processed. They can have a resulting HMF content of 5-7 milligrams per kilogram. To put this into perspective we are talking about 5 parts per million. Raw agave may be a bit higher due to longer periods of heating at the lower temperatures, but still negligible and presents no health concern. Agave produced enzymatically will be HMF free. Loving Earth agave syrup is produced enzymatically. HMF is also commonly found to a much greater degree in wine. 5. Nutrient Void. Agave syrup is not a whole food - it is fractionated and processed, devoid of the nutrients contained in the original, whole plant. But, you can’t use the whole plant to sweeten your foods. There is no sweetener that is a whole food, that is the nature of them. His charge is meaningless in reference to sweeteners. Sugars are not consumed as a meal, they are ingredients and an important part of a balanced diet. 6. Enzymes. Agave syrup is not a live food. The natural enzymes are removed to prevent agave syrup from fermenting and turning into tequila in your food pantry or cabinet. Actually, tequila is distilled so you unfortunately will not be able to produce it in your pantry. Digestion though is accomplished by enzymes, to break food down into a simple form which can easily be absorbed. Like honey, agave is already in its simple form and does not require digestion, enzymes nor exertion for our system to utilize them. 7. Addictiveness. Agave is, for all intents and purposes, highly concentrated sugar. Sugar and sweeteners wreak havoc on your health and are highly addictive. Sugar and sweeteners are an important part of one’s diet. People enjoy them and will use them. The important message is to moderate the overall consumption of sweeteners and calories in general. In the context of a normal everyday balanced diet, Mercola’s views are not substantiated. Response to Rami Nagel’s article - By Craig Gerbore, President of Madhava - our agave syrup is produced the same as Madhava. In response, I must first point out that Mr. Nagel’s article is based on the view of a sole individual, Russ Bianchi. I suppose we should thank Mr. Bianchi for pointing out some issues that may have contributed to Iidea’s (the initial manufacturer of blue agave nectar) demise from the market, however I want to be clear, this is not about Madhava or our agave nectar. Once a dominant supplier, as of this past summer Iidea is no longer a major supplier in the agave syrup business. The distributors using them as a supplier have quietly switched to newly formed blue agave companies for their supply. Madhava has always worked exclusively with Nekutli, the producer of agave nectar from the agave salmiana, a very different species of the agave. However, there is no mention of our agave nectar from salmiana in the article, nor of the differences in the plant, the collection and production of our product. So, the author has blurred the line with his all encompassing attack on blue agave nectar, by his failure to present complete information on the subject of agave nectars. For what purpose was this article written? If it were to educate the public, I think it would include all the information available. With the errors and misstatements and half-truths, I don’t think this article is about education, it is an all out shotgun attack. I believe Mr. Bianchi, presented as the sole authority on agave nectar, was initially introduced to Iidea’s blue agave syrup product on their entry to the market in the late 90’s. At that time, Iidea was promoting a 90% fructose agave syrup. This is what I believe Mr. Bianchi is referring to. Unfortunately, he ignores the fact that this is not the agave sold on the market today, nor is it representative of Madhava’s product. In fact Mr. Bianchi has never even acknowledged the existence of our agave nectar from the salmiana variety. So, all his comments are apparently based on his experience with Iidea’s product, but I find ourselves caught in the blast. In their zestful attack against the blue agave syrup he was introduced to initially, Mr.’s Bianchi and Nagel have also made inaccurate comments which reflect on agave nectar generally. As such, I take issue with several of their statements and claims and want to clarify some things as regards Madhava’s Agave Nectar from agave salmiana. Their discussion of the processing of agave nectar is in no way reflective of how Madhava’s agave nectar is produced. There are three ways to convert complex sugars into a simple sugar sweetener such as agave syrup. It can be done thermally, chemically, or enzymatically as ours is. There are no chemicals whatsoever involved in the production of Madhava’s agave nectar from agave salmiana, nor is it cooked. Our agave is subject only to low temperatures during the evaporation of excess water from the juice. This statement, which is the foundation of much of their argument comparing agave nectar to corn syrup, has no basis in scientific fact, THERE IS NO STARCH IN THE AGAVE. How can the author and his source be so mistaken on this statement on which he bases his attack? All plants store energy in one of two ways, as starches or fructans. All agave plants create fructans as their energy storing means. So, agave plants have fructans, not starch. From Wikipedia: Inulins are a group of naturally occurring polysaccharides produced by many types of plants. They belong to a class of fibers know as fructans. Inulin is used by some plants as a means of storing energy and it typically found in roots or rhizomes. Most plants which synthesize and store inulin do not store other materials such as starch. There is no starch in either species of agave, and agave nectar is not from starch as the author and Mr. Bianchi claim. They have tried very hard to propagandize the public with a false fact, either by design, or ignorance, for which there would be no excuse. Such an error of fact certainly casts doubt on the validity of the rest of Nagel’s article, as the lack of depth of his research has to be apparent to all. Really, he is just regurgitating the singular views of Mr. Bianchi. I personally spoke with the author during his “research”, as did at least one other in the industry. He chose not to include one word of the information given to him by us, which I will repeat below, and failed to make any distinction between Madhava’s Nekutli agave nectar from salmiana and that from the blue agave plant. He only mentions blue agave. The plants differ, the locations differ, the methods and production differ greatly. The information we gave him did not fit his purpose and so was omitted in favor of a generalized attack. The blue agave plant is harvested and the blue agave nectar is produced by a completely different method. I will have to leave it to the blue agave nectar sellers to comment on the production themselves. While I know of it, I have not witnessed it as I have Nekutli’s. Unlike the author, I won’t comment publicly on something I cannot verify. To clarify further on another claim, “Agave Nectar as a final product is mostly chemically refined fructose”. As regards Madhava’s agave nectar, there are no chemicals involved in our production whatsoever. The sugars in our agave nectar come from the breakdown of the inulin molecule through the introduction of the enzyme to break apart that molecule. It is in no way chemically refined, there are no chemicals involved in any part of the production or packaging process. Our agave nectar is refined only in as much as the excess moisture is removed from the juice of the plant. “HFCS is made with GM enzymes”. Bianchi’s states “they (agave and corn syrup) are indeed made the same way” This is another false assertion as regards Madhava’s agave nectar at least. Our agave nectar is certainly and clearly not made the same way as corn syrup. There is no starch in our agave. There are no chemicals, no refinement beyond the evaporation of water. And, there are no GMO’s whatsoever. The agave salmiana has never been subject to this and the enzyme is a natural, non GM organic, vegan enzyme. Other points regarding fructose apply to sugars in general and are a consumption, or overconsumption issue. Certainly consuming large amounts of sweeteners of any kind will be detrimental to one’s health. Suggesting fructose could cause health issues when concentrated amounts are eaten is a statement which should really apply to the overconsumption issue. The information the author links to agave nectar is the result of megadose testing of pure clinical fructose. Not the same thing as normal daily use of agave nectar in the course of our meals. The antisweetener advocates just have to admit that it is the overconsumption of sugars that is the problem. Used in moderation, sugars serve a purpose, to make other foods and beverages more palatable. Imagine a world without sweeteners if you can. Affinity for sweet taste is a human trait that most want to satisfy. For those who use sweeteners, there are limited choices available and many choose agave for its particular attributes. It is a good choice. Madhava Agave’s neutral flavor suits the purpose. It is in fact low glycemic, organically certified and non allergenic. Many with diabetes and other special diets find it suitable for their use where other sweeteners are not. It’s easy to use and you can use less. While it remains up to the individual to maintain balance in their diet and monitor their overall consumption of sweets, Nekutli/Madhava’s Agave Nectar does have advantages over other sweeteners and that is why it has become so popular and received so much attention today. I think the information I have brought to light here clearly contradicts the claims contained in Rami Nagel’s article. Thank you for your consideration. Question: Is Agave Nectar Any Good? Have you ever used agave nectar instead of honey? I recently discovered it in our health food store. It has a lower glycemic index than honey and works just as well. I have used it in place of honey in your recipes. Answer: Agave (pronounced 'uh-GAH-vay') nectar is produced from several species of agave, desert plants native to the Americas, known as "maguey" in Mexico. (The blue maguey is used to make both tequila and mescal.) Not surprisingly, agave is an important crop in Mexico. Just before they send up their huge flower stalks, these plants store a lot of energy in their cores in the form of a sweet-tasting carbohydrate called inulin. Agave nectar is produced by expressing the juice from the agave core, then filtering and heating it and treating it with enzymes to convert the inulin to sugars. As you’ve noted, agave nectar is a natural sweetener that ranks relatively low on the glycemic load scale. It is sold in health food stores and online and has been growing in popularity in recent years. Although it provides as many calories as sucrose (table sugar), it is sweeter, so you can use less of it - say one-quarter of a cup to substitute for one cup of sugar in recipes. I like the taste of agave nectar and have started using it in my kitchen, as well as trying products that contain it. A 2006 review of the scientific literature on agave published in HerbClip™, on the Web site of the American Botanical Council, concluded that it is safe to use agave in the amounts usually found in foods and beverages, but the reviewers cautioned that pregnant women should avoid it because some species (more than 200 have been identified) contain anordin and dinordin, steroids with contraceptive effects that could lead to miscarriage. I think this is a very low risk. I am more concerned about the sustainability of agave as a food source, because demand may soon exceed supply. Note: While “some species” of the 200 identified contain anordin and dinordin according to the report, no research has been presented identifying these substances in the two species used for agave syrup. Nor have they been identified in agave syrup itself. The unfiltered Dark Agave has more minerals than the light filtered version, in addition to a richer, wilder flavour. Minimally processed agave provides vitamins, minerals and enzymes that are not found in other processed sweeteners. 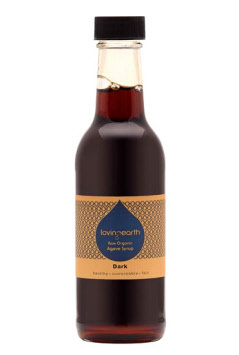 Our unfiltered Dark Agave syrup has a wide spectrum of minerals and phytonutrients. The filtered agave has a more neutral, pure sweer flavour, very similar to sugar. Agave Nectar has been used for centuries as a flavouring though native populations have also been aware of its health benefits and used it medicinally. The Aztecs used a mixture of agave nectar and salt as a dressing for wounds and a balm for skin infections and agave's use as a folk remedy persists today. 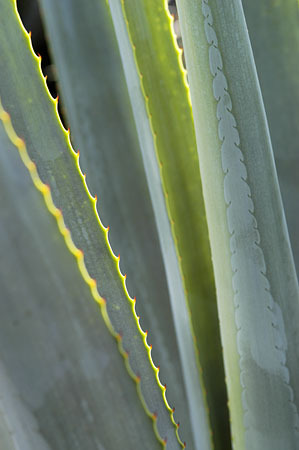 Scientific studies have confirmed agave's remedial properties. Agave nectar applied to the skin has been found effective against pyogenic (pus producing) bacteria such as Staph aureus. The tradition of adding salt to the nectar has been found to further boost its anti-microbial property. Agave nectar has also been proven effective against enteric (intestinal) bacteria. Organic Blue Agave nectars are species-specific made exclusively from Central Mexico's renowned Blue Agave plant. Blue agave (Agave tequilana var. Weber) a member of the Amaryllis family is a slow-growing plant that spreads runners from a 'mother' plant. Grown to USDA Organic Standards the agave is cultivated and processed without chemicals or genetic modification. After growing for 5 to 7 years a mature blue agave stands several feet tall and its carbohydrates are concentrated in the plant's core. The blue agave's treasure is held in the pina (so called because it resembles a pineapple after the leaves have been trimmed away). Inulin a dietary fiber made up of complex carbohydrates is not sweet by nature. Exposing (or hydrolyzing) the inulin to heat transforms it into sweet nectar. When making the Light Blue Agave nectar the juice is heated to a higher temperature for a short time. However when making the Raw Blue Agave nectar the process is lower and much slower: the juice is warmed to a lower temperature and the low heat is maintained for nearly twice as long. In this simple process the inulin becomes fructose a slowly metabolizing sugar found in many fruits and vegetables. Filtering determines the blue agave nectars' flavour and colour. This amber syrup is unfiltered.